Wow! After six years of blogging at Pilgrim Scribblings we have finally reached our 2,000th post. This is it! Hard to believe, especially when I think of the writer's block that has beset me much of the past two years. 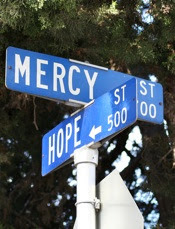 I'm grateful to God that mercy and hope have intersected (see photo) and He, the God of all hope, has been merciful and gracious over the years. So, we move on, trusting Him to provide for every need. God's blessings on you and yours, David ... as you continue to minister in whatever ways Jesus calls you to!!! I am looking forward to the next 2000 posts! !